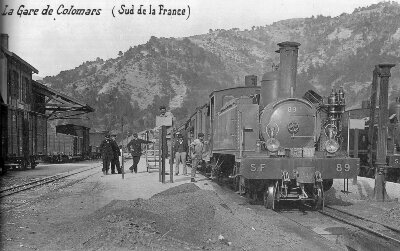 A network of 1 metre railways was built in the South of France at the end of the 19th century, run by the Chemins de Fer du Sud de la France (S.F. ), later to become the Compagnie des chemins de fer de la Provence (C.P.). (1) La Littoral. A coastal section ran from Toulon, via Hyeres and Ste Maxime to Fréjus and St Raphaël. (2) Nice-Meyrargues. A central section ran across the departments of the Var and the Alpes Maritimes, from Meyragues, via Draguignan and Grasse, to Colomars at the Var river, where it connected with the Nice-Digne section. This line ran from the end of the 19th century until it was closed in 1950. (3) Nice-Digne This section ran from Nice, up the Var river valley to Dignes-les-Bains. Thankfully this line is still in service today. Tramways were also built in the Alpes-Maritimes. These tramways reached into some of the remotest areas of the Alpes-Maritimes. One example is that from Menton to Sospel. The “Train des Pignes” is a name that was used locally for the old train on the Meyrargues-Nice and the Nice-Digne lines. Villagers used to collect pine cones (pommes de pignes) in the hills, usually the large cones from a pine called the pigne noir. They would collect the pine cones in large bags and leave the bags beside the railway tracks. The train moved through the hills very slowly — so slowly that passengers could get on and off the train while it was moving at it’s “normal” speed. It was a common sight for these bags of pine cones to be put onto the train as it passed, to be transported to the remote houses and farms for fuel. A number of brach lines linked the longer lines to places nearby, mostly in the Alpes-Maritimes. Grasse-Cannes: 1871-1938 for passengers, although the southern part of the line remained open for limited freight operations. The Cannes-Grasse line was reopened in 2005. Grasse – Cagnes-sur-Mer: left the Grasse-Vence route at Pré-de-Lac and followed the valleys down past Roquefort-les-Pins and Villeneuve-Loubet to Cagnes-sur-Mer. Vence-Cagnes-sur-Mer: went past Saint Paul-de-Vence and La Colle-sur-Loup. Some of viaducts and tunnel openings are still visible here, from along the road. Roquestéron: from the Var river, at the Pont Charles-Albert (between St Martin-du-Var and Plan-de-Var), this spur line followed the Esteron valley west to Roquestéron, passing just south of Gilette and Pierrefeu. Vésubie Valley: from Plan-du-Var, via St Jean-la-Rivière, Lantosque and Roquebillière to St Martin-Vésubie. Tinée Valley: this branch-line went up the Tinée valley from a narrow gorge at the Pont de la Mescala to St Sauveur-sur-Tinée, providing access to:La Tour, Bariols, Clans, Illonse, Marie and Rimplas. Dalius Valley: this line followed the Dalius valley up beyond the Gorges de Dalius. It branched off from the main line at the Pont de Gueydan and went to the small town of Guillaumes. http://www.beyond.fr/themes/lostrailways.html – this page gives a much fuller account of these lost lines and is worth a visit. This entry was posted in Railways and Tramways Around Nice, Railways Blog on December 11, 2013 by rogerfarnworth.